In my last installment Things We Like Thursday I covered how typography can be taken the digital age – today I express my appreciation for a business admired by designers around the world for their typefaces (and more! ), House Industries. Each House Industries project attempts to administer an art history lesson of sorts, and to share our appreciation for these influential design eras and practices. House Industries fonts are nothing near ordinary – from the architectural “Neutraface”, to zombie-friendly “Monster” House Industries provides many styles to fit a broad range of needs, but be careful to be intentional with your font choices! Last year we incorporated a House Industries font, “Luxury Diamond”, into the rebranding work we did for Macatawa Bay Yacht Club. The club intended to project an atmosphere of “Casual Elegance” with the new aesthetic – we relied on “Luxury Diamond” to bring the elegance, leveraged the club’s existing burgee (flag), in motion, for a casual outdoors feel, and paired in a modern feeling sans-serif for a forward looking element. Not only does House Industries supply designers around the world with great font choices, they have expanded into selling ‘objects’ and clothing as well. In order to showcase one of their most recent fonts, Velo, which was inspired by cycling, House Industries put their design talent to work creating a full range of cycling accessories as well as an actual bicycle. Then they took that a step further by developing an amazing brochure which highlights their design prowess along side the versatility of their new font and the actual gear that is now available in their store. Printed up on amazing French Paper Co. (Yay Michigan!) paper, and sent to teams like ours off their mailing list, this is like kryptonite – work grinding to a halt while we all drool senselessly. 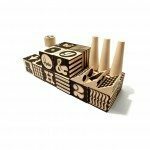 House Industries also produces sever sets of ‘blocks’, which are child – and designer- friendly play blocks, in collaboration with Grand Rapids, Michigan based Uncle Goose. 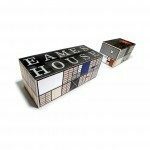 The block sets feature a variety of themes including an amazing House Industries Factory set as well as a block interpretation of the Eames House in Zeeland, Michigan. From amazing font families, to family friendly toys, combined with their connections to West Michigan, we admire what House Industries produces and contributes to the design world.